05-02-2012 CHASE LOG: MINNESOTA After seeing a tornado near Sedan, MN the day before, MaryLynn and I chased the following day in southern MN. This was kind of an odd set-up kind of day as convection from the night before diffused a synoptic stationary front that settled near the MN/IA border on the 2nd, while additional, small scale boundaries were leftover from the previous night’s convection as well. Even though there was a Moderate Risk in place across eastern NE and far western IA, I thought much of this would come after dark in the form of large hail and damaging winds from an overnight MCS. I chose to play the Slight Risk area across southern MN/northern IA instead. There was broad southwest to northeast flow aloft with a weak upper level trough in place and, consequently, a belt of 50 knot flow at mid-levels that led to effective vertical shear on the order of 45-55 knots, sufficient for the development of supercell thunderstorms. I decided to head down to Clear Lake, IA where I thought the synoptic boundary had settled during the day as very unstable conditions developed in the area with 100mb MLCAPE near 2000 j/kg. We checked out the town and the famous Surf Ballroom (https://www.surfballroom.com/), and then went to a park near the lake to wait. At 3:34pm CT, a mesoscale discussion was issued for areas from northeast NE into northwest IA and southern MN, highlighting the risk for severe thunderstorms, possibly supercells, and a low end tornado risk for areas along a developing warm front and other subtle boundaries. We started to progress back north on I-35 towards Albert Lea, while a storm began to develop in the vicinity of St James shortly before 5pm and a severe thunderstorm watch was soon to follow, issued at 5:30pm. This was right on the developing warm front so we made our way west on I-90 and then north on Hwy 169 where we intercepted this storm near Lake Crystal. The storm had a large base underneath the nicely vaulted updraft and began to produce a wall cloud upon approaching Lake Crystal. There was a lot of motion all over the place at this point with numerous areas of inflow and outflow, even some rotation, but nothing that concerned me that there was an immediate threat for a tornado. We followed up Hwy 169 into the southwest side of Mankato where the storm seemed to go from an organized base, possible wall cloud, to more of a shelf/outflow looking feature. 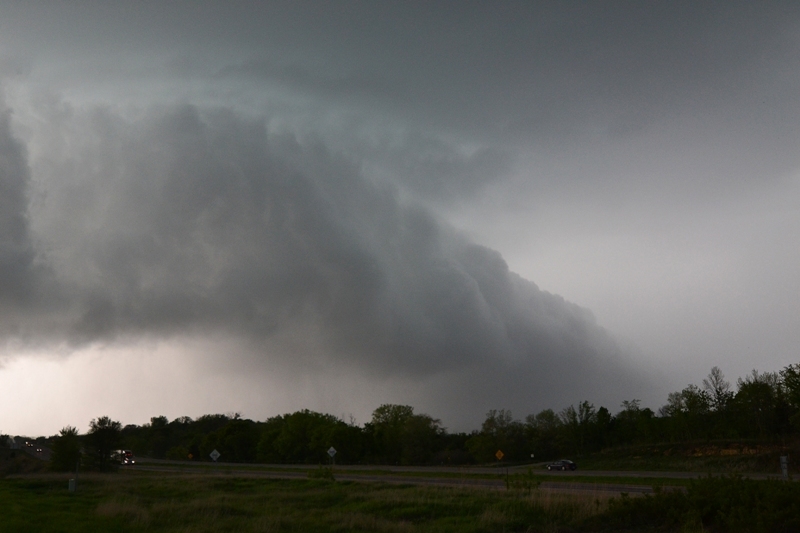 We then somewhat cored the storm upon going east on Hwy 14 on the northern side of Mankato. At this point, we encountered nickel sized hail with some quarter size mixed in. As we made it towards Eagle Lake, the storm was about to undergo a cell merger from a newly formed storm coming up from the south. As you can see in the photos and video below, we witnessed a funnel shortly before or near the cell merger somewhere off of Cty Rd 17 to the east of Eagle Lake. This lasted for only a couple minutes but it was a little nerve-wracking since the funnel was coming right at us. Quite the exciting experience though! We continued to follow the storm on Hwy 60 through Elysian and Waterville and then southeast on Hwy 13, then east on Hwy 66/12 towards Medford. From Elysian over to Waterville, we encountered a lot of hail that had piled up on the road and made for slow travel. There was even quite a bit of ice fog that had formed from the melting and reduced visibilities at times. It was quite the spectacle with this raging thunderstorm going on just to our northeast as we followed. The storm did produce another couple of lowerings through the duration and an apparent wall cloud as the storm became better organized near Medford. But as we approached Kenyon, the storm became outflow dominant and bit messy. This is where we called things off for the day and then had short trip back down to my parents for the night. One of the shorter drives to our final destination that I’ve ever had after chasing! Lowering forming underneath the updraft to the west of Lake Crystal, MN as we approached from the south. Another view of the lowering underneath the vaulted updraft on the storm west of Lake Crystal. Fairly fast condensation into the lowering occurring on the southwest side of Mankato off of Hwy 169. Core of storm to the right. Funnel forming on the storm just to the east of Eagle Lake, MN on Cty Rd 17. Shortly before or near the time when a cell merger was taking place. Another shot of the funnel to the east of Eagle Lake. Hail covered roads near Elysian, MN on Hwy 60. Hail drifts between Elysian and Waterville, MN on Hwy 60. Notice how covered the field is in the distance. Hail fog forming off Hwy 13 southeast of Waterville, MN. 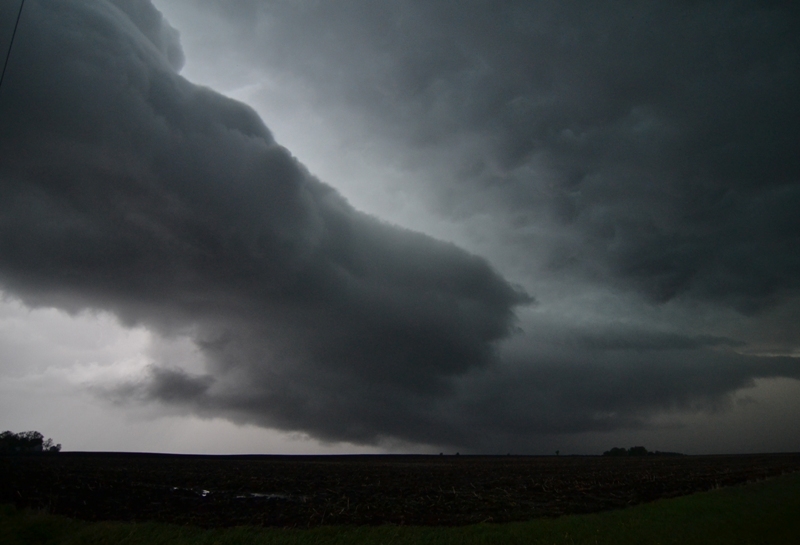 Storm producing a roll cloud as it became more outflow dominant south of Kenyon, MN. Another view of the storm starting to gust out to the south of Kenyon, MN.